If the good old fashioned Sylvanas wasn’t good enough for you. Here’s Chocolate Sylvanas. Are there any Filipinos out there who remember Sambos? I looooooove Sambos. PERIOD. It was sold at Café Elyseé waaaaaaaay back. (lol). 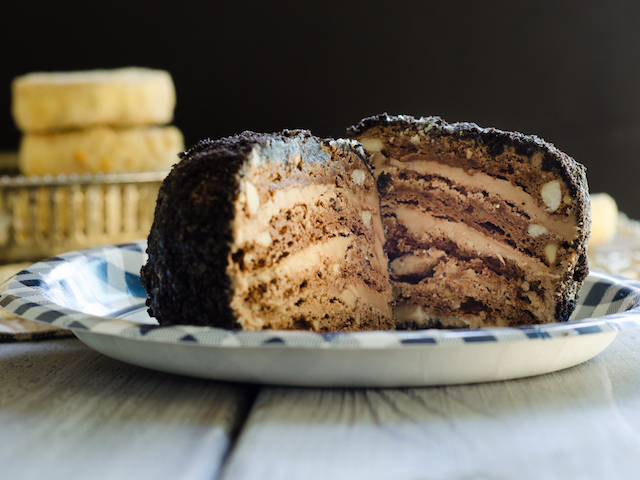 I tried recreating Sambos based on some very fond memories, making everything with chocolate, including the dacquoise. For the buttercream, if you find that 1 cup of melted chocolate is too much (seriously?) you can lessen it to about 3/4 cup. To coat the Chocolate Sylvanas, I used crushed Oreos (just a personal preference, you can use chocolate cake crumbs, too). Let’s step up our Sylvanas game and make Chocolate Sylvanas – Happy Baking! Fold the cocoa powder and chopped cashew carefully without deflating the meringue. Transfer the meringue into a piping bag with a plain tip. If you don't have a piping bag with a plain tip, you can use a ziplock bag instead, just cut one corner tip. Bake at 300F for about 30 minutes or until the dacquoise can be lifted easily off the baking sheet. Remove the wire whisk attachment from your stand mixer and replace with the paddle attachment. Melt the chocolate over bain-marie/hot water bath or use the microwave. If using the microwave, pay close attention the chocolate could get scorched - melt it at 15 seconds intervals, stirring it in between intervals. Once the chocolate has melted, let it cool down before adding to the buttercream. Add the melted chocolate to the buttercream and continue to beat until chocolate has been incorporated. For each chocolate sylvana, I used 4 pieces of chocolate cashew dacquoise. Fill it each layer with buttercream, mask the sides and top. Refrigerate for 30 minutes to set the buttercream. Once chilled, apply buttercream on the bottom and roll it on the Oreo crumbs. You can trace 1.5″- 2″ circles on paper (so you can re-use it) and place it underneath the parchment paper, remove before baking. Or directly draw circles on one side of the parchment paper and turn it over when ready to pipe.